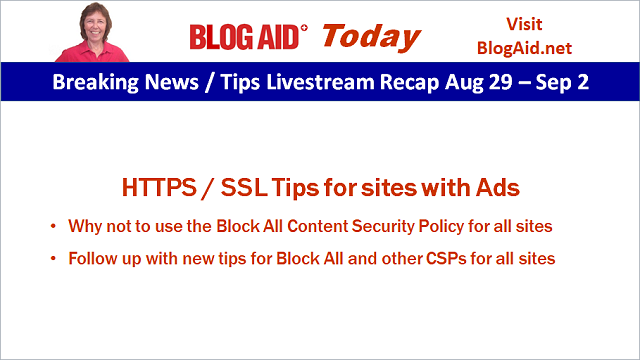 Breaking News from MediaVine with a new CSP they suggested you use to block all non HTTPS ads. That’s fine, unless you did the duct tape / chicken wire free way of converting your site to HTTPS. You’ll likely end up blocking a lot more than those ads. See my post on this topic for more details. I did more testing and found that the first CSP MediaVine suggested using is safe for all sites that have had full, real conversions and is a good idea. But, the second CSP to block all is not a good idea for most sites, including those that have had free conversions, unless you are running ads. You’re better off using the MediaVine plugin than having the CSPs hard-coded, as this situation is still in flux. They’ll be keeping their plugin updated with works best for most of their clients.